1. Pro 1:1 - "The proverbs of Solomon the son of David, king of Israel;"
A.	Solomon is identified as the author of the book of Proverbs. B.	Proverb n. - 1. a. A short pithy saying in common and recognized use; a concise sentence, often metaphorical or alliterative in form, which is held to express some truth ascertained by experience or observation and familiar to all; an adage, a wise saw. C.	In that a proverb is a short wise saying, the author of it must therefore be wise. D.	There was no man more qualified to write Proverbs than Solomon. i. He asked for an understanding heart rather than long life, riches, or the lives of his enemies (1Ki 3:9-11). ii. Because of that, God gave him a wise and understanding heart that had never, nor would ever, be equaled (1Ki 3:12; 1Ki 4:29-31). iii. There was only one man who was wiser than Solomon: the Lord Jesus Christ (Luk 11:31). E.	Solomon spoke 3,000 proverbs (1Ki 4:32). F.	Considering that there are 915 verses in the book of Proverbs, and the actual proverbs begin in chapter 10 (Pro 10:1), Solomon spoke well over three times as many proverbs as are recorded in the book of Proverbs. 2. Pro 1:2 - "To know wisdom and instruction; to perceive the words of understanding;"
A. 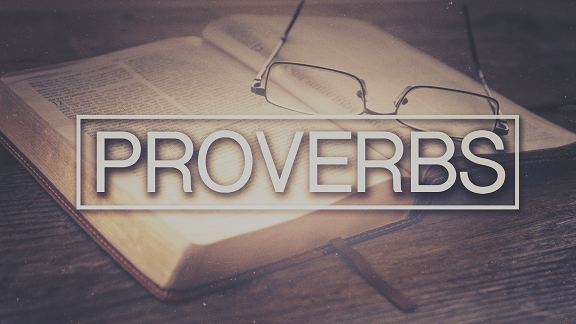 Pro 1:2-4 gives Solomon's purpose for writing the book of Proverbs. B. The primary purpose of the Proverbs is to know certain things. i. Know - I. 1. a. trans. To perceive (a thing or person) as identical with one perceived before, or of which one has a previous notion; to recognize; to identify. ii. Therefore, the human mind is capable of knowing things. iii. This may seem obvious, but this simple fact has escaped many so-called great minds, both of the ancient Sophists of Socrates' day, and their philosophical grandchildren of the Enlightenment, who "professing themselves to be wise, they became fools" (Rom 1:22) and declared that a man cannot know anything for certain. a. This, of course, is self-refuting nonsense. b. If it is certain that a man cannot know anything for certain, then he knows something for certain; and if it is not certain that a man cannot know anything for certain, then he cannot with certainty state that he cannot know anything for certain. iv. Solomon didn't need to prove that the human mind is capable of knowing, for it is a self-evident truth which must be affirmed to be denied. C.	Not only can the mind know facts, God created man's mind to be able to know wisdom. i. Wisdom n. - 1. a. Capacity of judging rightly in matters relating to life and conduct; soundness of judgement in the choice of means and ends; sometimes, less strictly, sound sense, esp. in practical affairs: opp. to folly. ii. Therefore, man is capable of knowing how to judge rightly in matters relating to life and conduct. iii. But he isn't born with this knowledge innately, for he is commanded to "get wisdom" (Pro 4:5), which demands that he doesn't have it naturally. iv. Man, therefore, has to learn wisdom in order to know it. D.	The next purpose for the book of Proverbs is "to know instruction." i.	Instruction n. - 1. The action of instructing or teaching; the imparting of knowledge or skill; education; information. ii. In order to learn wisdom, a man must first know that he needs to be taught, which implies that he must first recognize his ignorance. iii. The man that doesn't think he needs instruction, needs instruction, for "if any man think that he knoweth any thing, he knoweth nothing yet as he ought to know" (1Co 8:2). iv. Wise men receive instruction (Pro 9:9), but fools despise it (Pro 1:7). E.	The next purpose for the book of Proverbs is "to perceive the words of understanding." i. Perceive v. - 1. trans. To apprehend with the mind; to become aware or conscious of; to observe, understand. ii. Understanding n. - 1. a. (Without article.) Power or ability to understand; intellect, intelligence. b. of understanding, intelligent, capable of judging with knowledge. Similarly of some, of no, understanding. c. With the: The faculty of comprehending and reasoning; the intellect. iii. Therefore, the Proverbs were written to help us to apprehend with our minds the words of intelligence and reason. 3. Pro 1:3 - "To receive the instruction of wisdom, justice, and judgment, and equity;"
A. To "know wisdom and instruction" (Pro 1:2), one must "receive the instruction of wisdom" (Pro 1:3). i. Receive v. - I. 1. a. trans. To take in one's hand, or into one's possession (something held out or offered by another); to take delivery of (a thing) from another, either for oneself or for a third party. d. To take from another by hearing or listening; to attend, listen, or give heed to. ii. Instruction n.- 1. The action of instructing or teaching; the imparting of knowledge or skill; education; information. iii. From this we can learn three things. a.	Firstly, it tells us that the instruction of wisdom is available for the taking. b.	Secondly, it lets us know that for a man to acquire the instruction of wisdom he must first desire it and be willing to accept it from another who is prepared to impart it to him. c.	Thirdly, for the instruction of wisdom to be received the recipient must exert mental effort by listening, attending, and giving heed to what he is being taught. B. Another purpose of the Proverbs is also to receive the instruction of justice, judgment, and equity. i. Justice n. - 1. The quality of being (morally) just or righteous; the principle of just dealing; the exhibition of this quality or principle in action; just conduct; integrity, rectitude. a. Justice is an integral ingredient for a happy and tranquil life, both personal and societal. b. Many people clamor for justice in the courts, but they themselves are not just and righteous in their personal lives. c.	Is it any wonder that justice has been turned on its head in the United States when judgment has not first begun in the house of God (1Pe 4:17)? d.	If God's people would judge themselves, they would not be judged by being given leaders who pervert justice (1Co 11:31). e.	Justice will not be found in a society devoid of wisdom. f.	By wisdom kings are supposed to reign and princes decree justice (Pro 8:15), which is why the instruction of wisdom must be first received, and justice will follow (Pro 1:3). ii. Judgment n. - 1. a. The action of trying a cause in a court of justice; trial. 8. a. The faculty of judging; ability to form an opinion; that function of the mind whereby it arrives at a notion of anything; the critical faculty; discernment. a. Judgment and justice go hand-in-hand. b. These two virtues are essential in a good leader, as the Lord told David, "he that ruleth over men must be just, ruling in the fear of God" (2Sa 23:3). c.	God chose to us Abraham because he would "do justice and judgment" (Gen 18:19). d.	Every father would do well to follow Abraham's example. e.	The great king David "executed judgment and justice unto all his people" (2Sa 8:15). f.	God made Solomon king for the same purpose (1Ki 10:9). g.	O that leaders today would rule in the fear of God and do justice and judgment! h.	But men can't expect their leaders to execute justice and judgment if they themselves live morally reprehensible lives. i. Some men reason that getting religious will make up for their lack of principle and integrity, but the scripture says that "to do justice and judgment is more acceptable to the LORD than sacrifice" (Pro 21:3). iii. Equity n. - 1. The quality of being equal or fair; fairness, impartiality; evenhanded dealing. a. Even children have a sense of fairness, at least when it comes to how they are treated. (i)	A common chorus in every home with young children is "that's not fair!" (ii)	While nearly all men know that they should be treated fairly, and quickly recognize when they have not been, many of them have a memory lapse when it comes to their dealing rightly with others. (iii)	Hence the importance of reading the book of Proverbs, to "receive the instruction of . . . equity" (Pro 1:3). b. Our country resembles Israel of old when it comes to a lack of equity (Isa 59:14; Mic 3:9). (i)	The wealthy pay a much higher percentage of their income in taxes than do lower income people. (ii)	Certain classes of people are accepted into universities and offered jobs based on their skin color, sexual preference, or protected status. (iii)	The ultra-rich and famous get off with short, cushy jail sentences for crimes that a normal man would not, such as billionaire Jeffery Epstein who served a 13 month sentence in a private wing of a county jail with work-release and immunity from further prosecution in the future for molesting young girls. c.	Dealing equitably with people is especially important for pastors (1Ti 5:21) and all Christians alike (Jam 2:1). d.	The Lord Jesus Christ is the model of a man who was just and fair in His dealing with men (Isa 11:1-5; Mat 22:16).